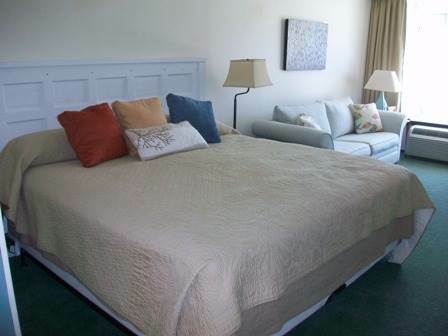 Causeway Inn condotel centrally located on beautiful Ocean Isle Beach. One bedroom, one bath second floor condo located only one block from ocean and walking distance to local restaurants and activities. Recently updated in 2012 with everything new! The bedding is updated with memory foam mattressa. Condo has in-room microwave, coffee maker, small refrigerator, and flat panel TV/DVD. Onsite outdoor swimming pool and large sundeck area with great views for your enjoyment! NON-SMOKING. Rented on a nightly basis. FREE Wireless Internet Access! Bedding: King, Queen Sleeper Sofa. Sleeps 4.